Tyler and his friend Freckle can’t believe their eyes as they watch a stone building rise up from its foundation and disappear into a whirling cloud of dust. When the building comes back, the boys discover it’s a bike shop, complete with a talking parrot, and Quentin Quigley, a bizarre old man who looks more like a wizard than a shop owner. Who is this strange man and why is there a human skull in his shop? 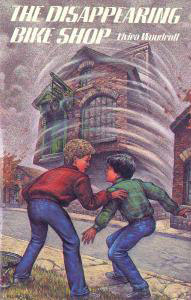 As the two boys get trapped in one of Mr. Quigley’s remarkable inventions and travel through time in a hair-rasing adventure, they discover the wizard’s true and surprising identity.